The Charlood society decided in 1997 to celebrate the Millennium by producing three pictorial maps, depicting the life and times of Charlwood through the ages dating from the ‘Mists of Time’ to 2000, which in the event took six years to complete and involved some 300 Charlwood residents of all ages. Charlwood cannot escape the pressures of the modern world. Like many other villages it depends on the outside world for employment and shopping for goods and services. It suffers from an insatiable demand for extra housing and its roads, instead of being routes to the outside world, are now backways to Gatwick Airport. The pressures on the village are enormous. Charlwood is not a place for Merrie England but it is still a good example of a medieval village. 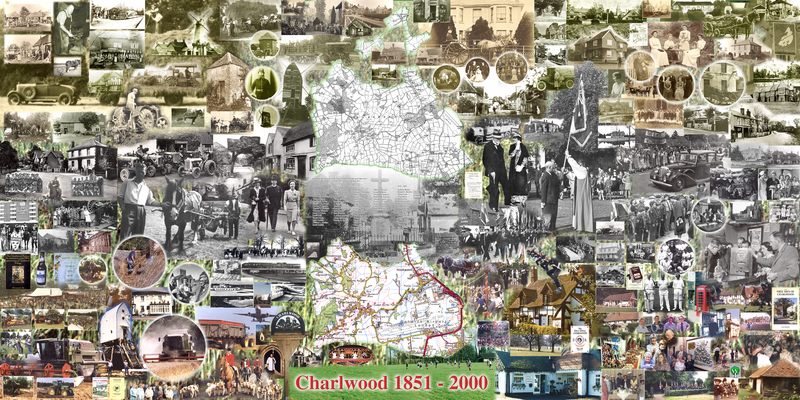 That Charlwood thrives today, is thanks to the unwavering efforts of it’s local community through the years. This is dedicated and determined action continues today. It is fitting that a ceorls, with his axe ready for clearing the oak forest which covered the area, dominates the first map. The Village takes its name “the wood of the ceorls” from the peasant smallholder class who originally settled here. Behind the ceorl is the Norman, thatched roof church that architectural historians date at around 1080. The earliest written reference to Charlwood is a century later when Thomas Becket, acting in is capacity as lord of the manor, writes a letter excommunicating the Vicar and Rector of Charlwood who were probably pocketing the manorial dues which shoud have one to the Priory of Christchurch, Canterbury. The Low Weald is mainly heavy clay, which is fine for growing timber but unrewarding to clear and cultivate for crops. The first people to venture into the woodlands were hunters after game and swineherds who would bring down pigs from settled lands to the north and fatten them on acorns. There is a legend that Charlwood women took part in the battle against the Danes at Ockley in 851 but it is unlikely that there was any settlement here until a century later when England was no longer subject to marauders. More settled conditions resulted in general increase in population encouraging people to move into hitherto uncleared lands and to clear woodlands for dispersed homesteads, a the American West was later developed. A village centre developed much later, mainly to the east end of the church. Charlwood always seems to have been slightly more prosperous than neighbouring villages and its church, when built would have been a local wonder as it was built of stone when most rural churches were still being built of wood. Stone capable of being dressed had to be brought from Reigate but rubble stome for the walls was found on nearby Stan (“stone”) hill. A large stone pit still exists on the hillside over looking the church. Legends have grown up that this was where the bells for the church were cast and the devil interfered. The original Norman tower wa too low for a peal of bells and the present ringing chamber was actully a room for visitors from the Priory. 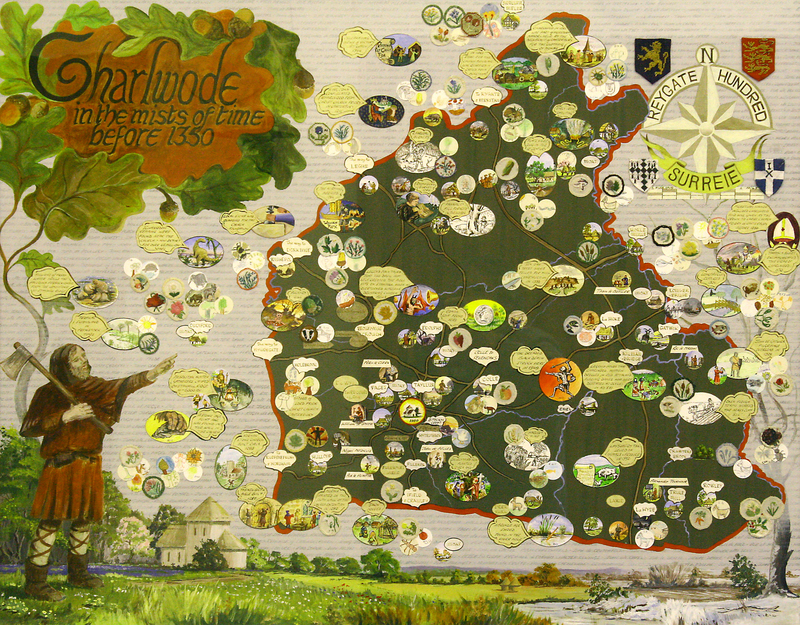 Many manorial records of the 13th century onward survive and the names of the villagers form the background of the map. Several of these names occour in surrounding manors indicating that Charlwood was by no means isolated. In 1241 a John de Gatwyk, originally from Steyning. settled in the village when he was a clerk in the service of the Earl of Surrey. His descendants became local lawyers and, around 1256, one of them added a south aisle to the church, with a lady altar at the end, by the present pulpit. Wall paintings of St Margaret, patron of childbirth, and St Nicholas, in his guise as patron of students, were added in around 1290 to celebrate the birth of another John, who was to be the last in the Charlwood line. The tax return of 1332 shows John to have been one of the wealthiest of the lesser gentry in Surrey with the social position to be able to marry his daughter to a half cousin of Baron Sterborough of Lingfield. John’s status required him to have the king’s permission to leave the country to go on a pilgrimage and his expertise earned him a place in the embassy to Flanders which negotiated the European depot for English wool exports. Shortly before his death, around 1340, he added a further wall painting of the Three Living and Dead, a story popular in the Flemish court in whivh, like the ghosts in Dicken’s Christmas Carol, corpses admonish the wealthy for their selfish life style. One has to wonder what the illiterate peasant congregation made of the picture. The dominant figures in the second map are gentry, for this is the period when this social class emerges and, in Charlwood, the families of the Sanders and, later, the Jordans (with their coats of arms at the head of the map) rose to eminence as lawyers, county sheriffs, members of Parliament and holders of positions in the royal administration. The Sanders came to Charlwood from Horley in the 14th century. Initially they were farmers but one, Thomas, acquired a number of properties and augmented his rental income by developing the local industries of iron production and timber management. There are records that later family members supplied prefabricated buildings to London and timbers to Nonsuch Palace. The family also seems to have had an ironworks at Ifield and they had family and business connections with many ironmasters, including John Culpeper who cast a canon which is now at the entrance to Wakehurst Place. Thomas had enough education to become a commissioner of the peace and a tax collector for Surrey, positions that brought him into contact with leading local families and he was able to marry his youngest son to Joan Carew, a member of a family with court connections and with whom the Sanders were to remain close for several generations. Thomas died around 1450 and the south porch to the church was added by the family in his memory. Thomas’s eldest son, Richard, and youngest son, William, seem to have prospered and extended the aisle in the church, built by the de Gatwyks, to form a new Lady chapel which also served as a burial chapel for the family and in which annual remembrance services could be held after their deaths. The chapel must have been built by 1470, when Joan Carew died, but the frieze on the screen, which commemorates Richard by his initials and William by the coat of arms he adopted, was added some 25 years later, perhaps being originally part of an inner arcade in front of the altar. church and the Sanders success took them to London. With the Sanders gone the Jordan family comes to the fore. There had been a Jordan ever since the manorial records began and they were tenant farmers running the de Gatwyk estate which they finally bought in 1495. A fortunate marriage, recorded on a brass memorial in the vestry, brought the family to follow in the Sander’s careers in county service until the senior male line died out in 1750. The iron and timber industries died out in the early 17th century and the village reverted to being dependant on agriculture with limited access to local markets. The village did not decay, but nor did it prosper. The population must have remained static as, of the 136 occupied houses in 1801, almost all were 100 years or more old and nearly half of these are still standing. There was work for builders, mainly in the construction of farm barns and public buildings. Windmills required regular replacement (the stump of one remains and another has been rebuilt on a new site. The village had its social problems in the 18th century when a lock-up (the Cage) was built to house malefactors before being taken to Reigate for trial. The poor were provided for in four tiny cottages on the edge of the churchyard and a pair of almshouses, all of which were pulled down when a workhouse was opened in Reigate and the land is now part of the churchyard. One of the first schools in the area was built by the rector, John Bristow, in 1620, which is now a cottage with the Lord’s Prayer painted on the schoolroom wall. Quakers were very active for a period, using Tanyard Farm as a meeting house and the field beyond as a burial ground. Baptists bought the guardhouse from the Napoleonic barracks in Horsham and is still in use as Providence chapel. A record of 1758 mentions that there were one gentleman, forty yeomen and sixty farmers . No squirearchy developed but the church was maintained in good enough condition not to require well meaning restoration in Victorian times and the Rectors made valuable contributions to the welfare of their parishioners. 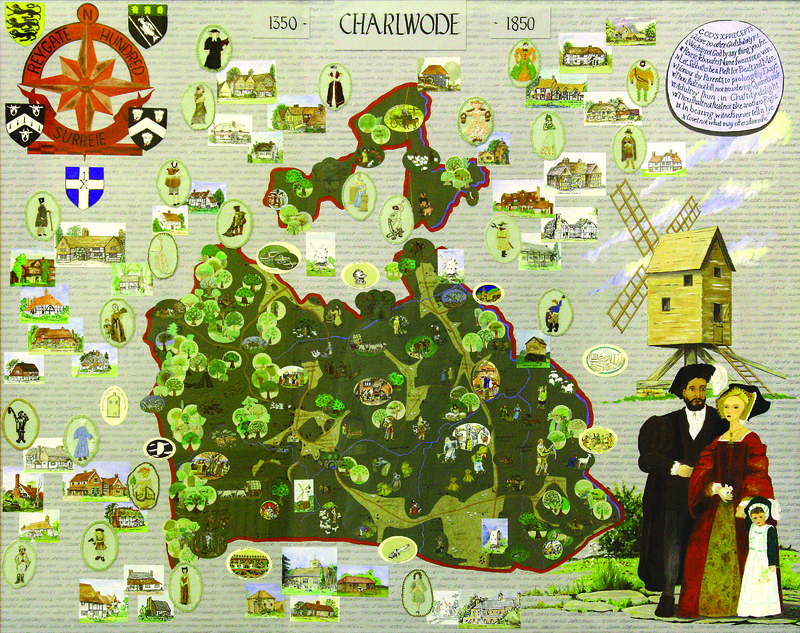 The third map is busy with images reflecting that, in the period covered, Charlwood changed from a remote village often omitted from the notebooks of visitors to Surrey, to a place in the modern world that supports a vibrant local community. In medieval times Charlwood houses were built around the edges of commons through the centre of which ran the roads. The commons were enclosed in the mid 19th century adding extra frontage to properties which, in many cases, were sold as building land when new housing was required. The opening of the new Brighton road in the early 19th century, replacing the old route through Horsham, stimulated development in Crawley but left Charlwood largely unaffected. The railway reached 1 lorley in 1841 and rapidly changed that place from a village the same size as Charlwood to a compact town. Initially the effect of the railway on Charlwood was limited. The census returns suggest that Charlwood hit a bad patch at the time as, whereas most farmers employed at least one domestic servant in 1841 there had been a cutback by 1851. Despite the hard times a new boy’s school was built in 1840 to be followed by the first girl’s school (now the Parish Hall) in 1854. The effect of the railway becomes more pronounced in the 1871 census returns which show the demand for bricks had led to the reopening of brickworks in the village whilst a few residents worked for the rail-ways. The first beneficiaries were the former hamlets of Hookwood and Lowfield Heath which were both near the railways and roads leading to the stations. Lowfield Heath, being further from a neighbouring town than Hookwood, had its own church designed by the leading architect, William Burges, which was consecrated in 1868. Improved transport encouraged the very wealthy to build grand mansions on the sandstone hills around Crawley. The poor drainage of Charlwood soil attracted a few commuters to build more modest houses which employed a groom and a small domestic staff. Some of these houses remained in family ownership for only one generation and none continues to be occupied by a single family today. Easier access to markets gave a fillip to agriculture and some farmers could afford to add comfortable extensions to their Tudor houses and build labourers’ cottages. It was the advent of the motor car which changed the fortune of the village. Whilst some people were happy with mock Tudor houses in London suburbs others found, in Charlwood, real Tudor houses that they could restore and modernise on the edge of the country but in easy access of towns. It was some time before Council houses were made available for the dispossessed villagers. Although a motor bus service connected the village to the outer world it was the development of Crawley New Town that provided the first sizeable employment opportunity for Charlwood villagers. Mechanisation was rapidly reducing the need for agricultural workers, whilst social changes had cut the opportunities for full time domestic service. New local work opportunities enabled the village to retain a social mix of new and old. The area of the Parish was slightly reduced in 1894 when civil parishes replaced the muddled land boundaries of the, now defuct, manors. One anomaly remained in a detached part of the Parish to the north which was only transferred to Salfords and Sidlow in 1972. It was intended, at the time, that Charlwood should be incorporated into Crawley in the boundary reorganisation but the villagers successfully protested against becoming a suburb. The price was the partitioning of the Parish and the transfer of Gatwick airport to West Sussex. Towards the end of the 19th century rural employment opportunities developed around Lowfield Heath when, in 1871, John Cheal started a horticultural business and later became one of the leading nurserymen in the country. Twenty years later, at Hookwood, a racecourse opened in the parkland of Gatwick house. A small landing ground for aeroplanes was provided in the 1920’s. In the 1950’s the landing ground was chosen as a relief airport for London’s Heathrow and its southward expansion has engulfed Lowfield Heath, leaving its lone church as a memorial to a lost community.